New Delhi, April 28: The Indian Army has sent a very strong message to Pakistan military on Friday and asked to stop supporting terror groups in Jammu and Kashmir. Notably, the unscheduled interaction over the hotline took place last evening following a request by Pakistan. 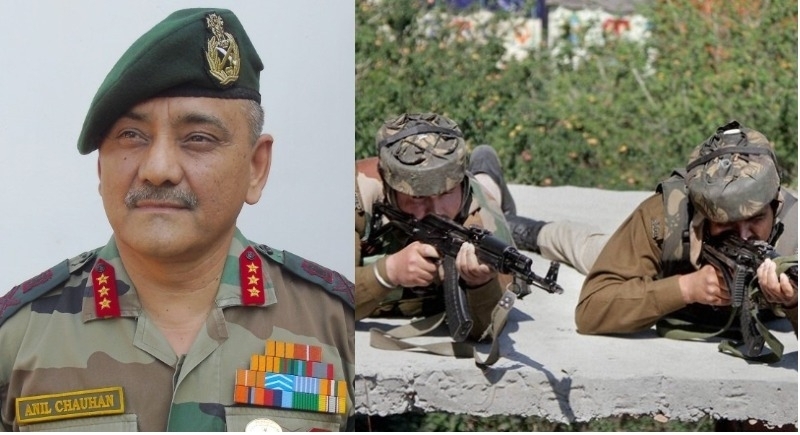 Notably, the Indian Army's Director General of Military Operations (DGMO) Lt Gen Anil Chauhan spoke to his Pakistani counterpart and asked them to stop supporting terror groups in Jammu and Kashmir and further vowed to retaliate against terrorism. In a telephonic conversation, Indian Army's DGMO told his Pakistani counterpart that the onus on bringing down tension along the Line of Control in Jammu and Kashmir lies with Pakistan. Lt Gen Chauhan also asserted that India will continue to take all retaliatory measure to foil Pakistan's evil designs. The telephonic conversation comes days after Indian forces eliminated four terrorists belonged to Pakistan based terror outfit Jaish-e-Mohammad (JeM) in a fierce encounter in Lam forest area of Tral town of South Kashmir's Pulwama district. In October last year, the Indian Army said that it does not target innocent citizens and always maintains impeccable standards of professionalism while talking to Pakistan military in an unscheduled hotline call requested by neighbour country. Importantly, Indian security forces have led a massive war against terrorism and terrorists in the inner parts of Jammu-Kashmir and forward areas. Therefore, Anti-Terrorism operation is continued with such a speed that more than 206 terrorists were eliminated by Indian troops last year.